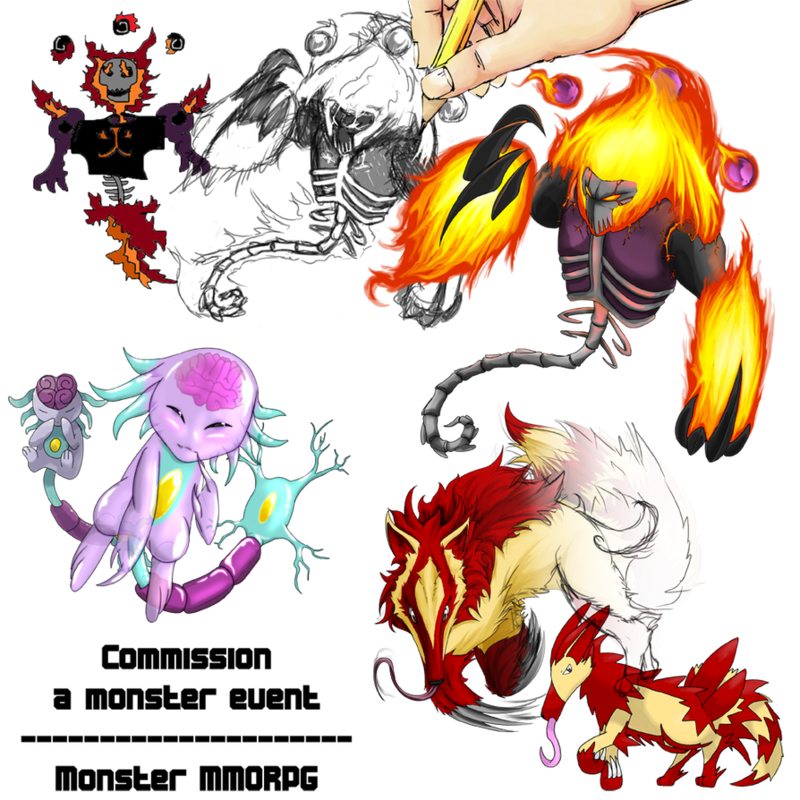 Here at MONSTER MMORPG, a heavily community based monster game, there was always a chance for players to donate drawings (self-made or bought) for the game, but it wasn't really popular. So I tought up something to make this option a little more rewarding. In the light of Monster MMORPG player's current interrest in having their own designed monsters put into the game, I decided to make a little event happen with the help of the founder of the game. During this summer anyone commissioning a monster from us will get it only for $15 USD. -you will receive sketches of the making, being able to fully able to influance the making of the final piece in 3 points. First where I choose the pose for the monster, second when I sketch up the details and lastly the coloring. -you will receive your own monster in the game after it's finished and put into the game. The commission is simple. You contact me with your monster sketch on deviantArt or on the MonsterMMORPG forum and I give you the payment informations. Current I can only accept it via Paypal. -I'm tight on time. I must ask for Pre-payment, but you can see my previous works, you know I am trustworthy. -Monsters of the game are designed to be balanced in their own type. If you provide stats with your sketch, we can not ensure that the ingame version of your monster will have the same ones that you designed. -Please only contact me with original sketch. Knock-off designs from other brands/games may result in the monster's removal from the game and we won't be able to give a refund.